Sorry about the length of this topic but I think it's worth reading it. My Lonestar Classic - short head, beautiful cleans but unfortunately I was never able to bind with the drive channel. It was simply not possible to reduce the bass as much as I felt it would have been necessary. The perceived sound was without enough drive, pick attack was not there, everything that too much bass can damage was there. As a result the amp didn't get too much play. However, I have a friend who told me that he modified his Roadster specifically for this reason so I thought I might as well ask the guy if there is a solution for my Lonestar. He called me back and told me that unlike the Mesa Roadster which has a 22nF capacitor at the drive stage entry (which he needed to change because the value was too much - hence too much bass), the Lonestar has a 5nF capacitor at the entry in the drive stage. Nevertheless, he said we should try to change that capacitor for a 1nF. I agreed but not before I told him I don't want the clean channel to be messed with. He told me that capacitor is only for the drive channel, nothing will change in the cleans. Ok. So I brought the amp to his shop. I tested the amp for the unmodded sound, we agreed that it was way too much bass. Then we changed the capacitor. The original capacitor was the orange type that you see in the Mesa amps, we took it out and put a ceramic 1.5nF, not a 1nF because the guy was afraid that 1nF may be too small. Anyway, time for testing. Plugged in the guitar and... MAGIC!!! With bass between 11 and 12 o'clock, the sound was perfect. Took the amp home to test it on my cabinet and most importantly with my Suhr Reactive load. Before the mod, I might or might not have lived with the bassy sound through a cabinet but through the Suhr reactive load the sound was simply not ok, it was all over the place, couldn't use it. After the mod not only the sound is too good to be true, but the perceived drive is bigger. I mean like 50% bigger. The pick attack is to die for, the palm muted notes sound incredible. The guy explained me that if too much bass enters in the drive stage, then the harmonics which get amplified even more will cancel one another resulting in a lifeless tone with a low perceived drive. I am not an engineer, I can only attest for what I hear and feel. Let me tell you it is a different ball game. Now the amp sounds like in the clips that we all see on youtube, the clips that made many of us want to buy a Lonestar in the first place. I know this happened to me. The BIAS mod didn't do it for me, other mods - the same. But simply changing this insignificant capacitor made may amp sound like the one Andy Timmons demoed on youtube. To all the guys that have any technical knowledge about this stuff, chime in. It's the 5nF capacitor that on the schematics sits at the entrance of the drive stage in front of two resistors, a 200K and a 1M. Just realized that the flabby/muddy bass issue with the Lonestar Classic is already addressed in a previous post entitled "Flabby/Muddy Bass on the Lonestar? Want to change it?" I apologize that I "attacked" this issue again, Obviously the way of dealing with it is different and I feel I need to bring some clarification. First of all, yes, if you are happy, don't change anything. The guy who told me what I needed to do in order to solve this problem is what I consider an amp guru. He is an engineer and he does this amp thing for a hobby. Everybody I know in the music business knows this guy and he saw and modded many amps used by some of the best guitar players in my country. When I told him about the flabby/muddy bass on my Lonestar, he took time and looked over the schematics. Then I went to his place with my amp and, before even touching the screwdriver to open the amp, I had to sit and listen 20 minutes of amps history starting from Hendrix to Friedman, the evolution of the bypass capacitor starting from the earliest blackface up to the most modern Mesa. I agree that the evolution of the capacitor values from 1nF to 22nF as found in the more modern amps seems interesting even though I do not understand all the details completely but I appreciate a good story like we all do... Should I mention how many types of vintage capacitors exist? Anyway, he knew exactly what I was talking about reason being that many players complained about the bass thing on many amps including some Fenders and Rectifiers. So I asked him, why I do not have this problem with my Friedman BE? The answer, the 1nF bypass capacitor. Then he had to listen to me threatening him for 10 minutes that if he touches the clean channel he most probably will dye and the police will found his body in a dumpster. Then, well you know the story from the first post. I would put some pictures of the modification that I did but until now I wasn't able to figure out how to upload the pictures, I guess I need to have them on a website and insert the web link to them, I will try later. The fact is that after he modded the Lonestar Head (short head), I modded my Lonestar combo the very next day. Because I A/B them and I couldn't believe my ears the difference. I mean, it is a difference like from unusable to heavenly. That's how serious it is. The beauty of this mod is that it only mods the drive channel. 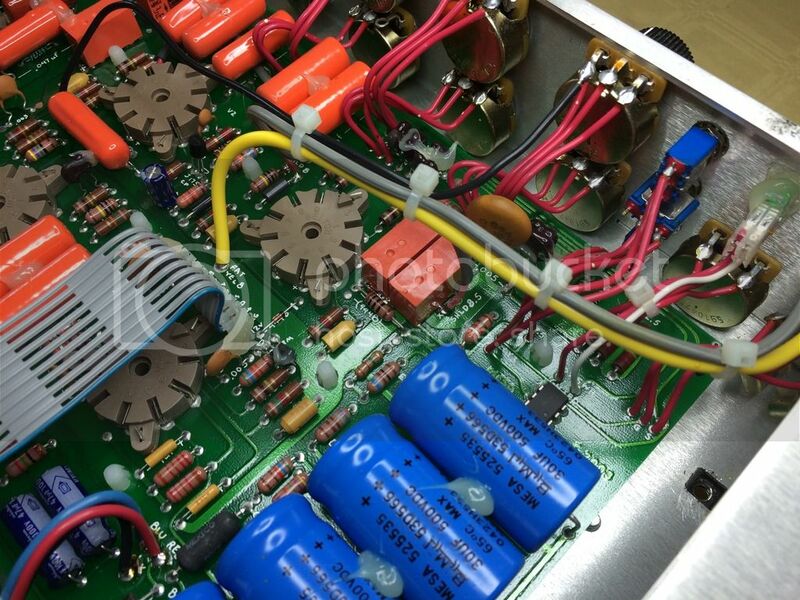 The bad thing is that the capacitor is in a position that requires either taking the amp apart and lifting the main board OR simply cutting the capacitor legs and soldering the new capacitor to the cut legs that remained on the mainboard from the previous one. Sounds worse than actually is, it took me 10 minutes to do it. But it's worth the effort. I know a guitarist that uses the Lonestar Classic on stages and he complains about the bass being almost unmanageable at volume. That's weird isn't it? Finally, I can use the Lonestar through my Suhr Reactive Load. Couldn't use that before because of the bass issue. I could use it with all my other amps like Friedman BE or the Dual Racktifier but the Lonestar sounded bad. Now it's perfect. I forgot to mention, in the Lonestar Head he installed a 1.5nF capacitor but for the combo I wanted to experiment and tried the 1nF capacitor. It is even better. But I will not change the capacitor in the head because even if it has a tiny bit more bass I can make them sound the same by adjusting the eq. And i should mention that comparisons were all done using a real cabinet. A 2x12 Custom Audio Amplifiers with UK made V30's. 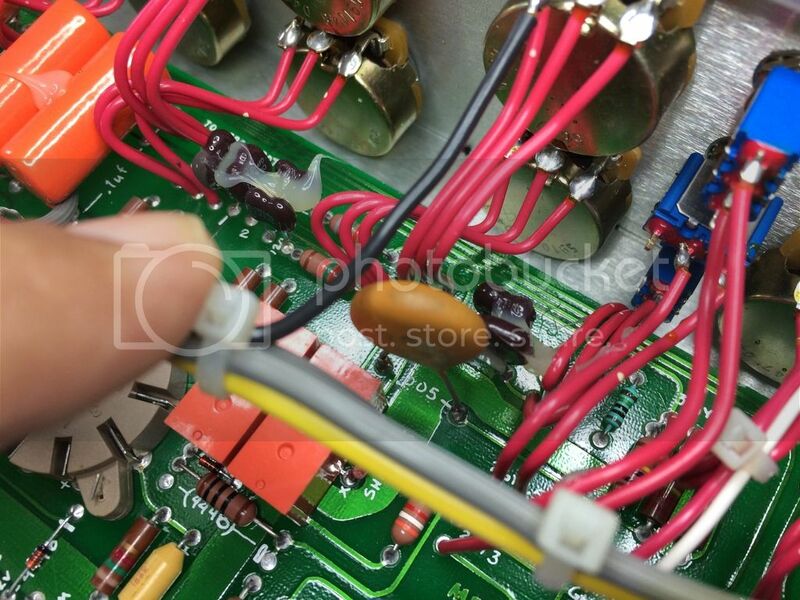 The original capacitor was of the orange tube like type that you can see in the pictures. The new capacitor is ceramic. 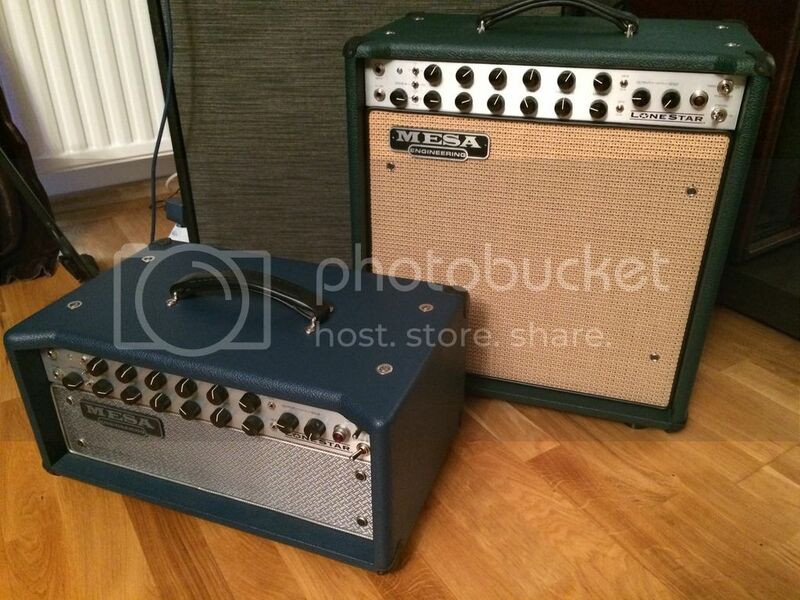 Interesting.Ive had both lonestars and loved them but the drive channel never really done it for me.I do like a thick distortion though but moved on to the mark v.Have you any audio examples of b4 and after?Preferably not a phone recording but a mic.Id love if mesa made a lonestar revision with an improved drive channel and matbe a 3rd channel.id snap it up straight away. I will post an audio recording with both the Lonestar Classic and the Special. I modded the Special too for the same reason, too much bass on the drive channel. I know what you mean when you say thick distortion and I believe this mod actually improves the "thick part" of the drive channel giving more bite and articulation compared to the previous state. I do not have a recording before the mod but I do have a friend who has a Lonestar Classic that he wanted to mod too after hearing my Lonestars. I'll see if he did it and let you know as soon as possible. I believe that we can find some people on this forum to help us with a "before" recording and you could compare with my "after" recording. Cool nice one.Ive had both b4 so have a fair idea how they sound before the mod.always handy to have one though as a direct a/b.Looking forward to hearing it.Theres no real quality audio clips of the famous reeder mod. Another less invasive way to tame the low end would be to run a good eq in the loop. I recently picked up a VFE Rocket parametric EQ and it really excels in the loop as a subtle bass cut and kick to the mids. I'm looking over the Lonestar schematic, and I'm hoping someone out there with more knowledge than myself can offer a confirmation on a few items. (1) In the above photos from Adrianni's post, is the stock .005uf the disc shaped pale orange capacitor, you can clearly see .005 labeled under it? (2) Based on the Schematic's symbol for this capacitor - it would appear to be non-polarized? If I'm correct about this, does this limit me to a specifically designated non-polarized capacitor ? I didn't realize how annoying that wet blanket sound was until I read a bunch of posts about it here, The next time I plugged in and started playing, i was forced to admit that a lot of you guys hit the nail right on the head, it was only after reading so many comments and having it fresh in my mind that the flubby bass hit me like a punch in the gut! Last edited by ToneDrone on Tue Jun 13, 2017 9:18 am, edited 1 time in total. 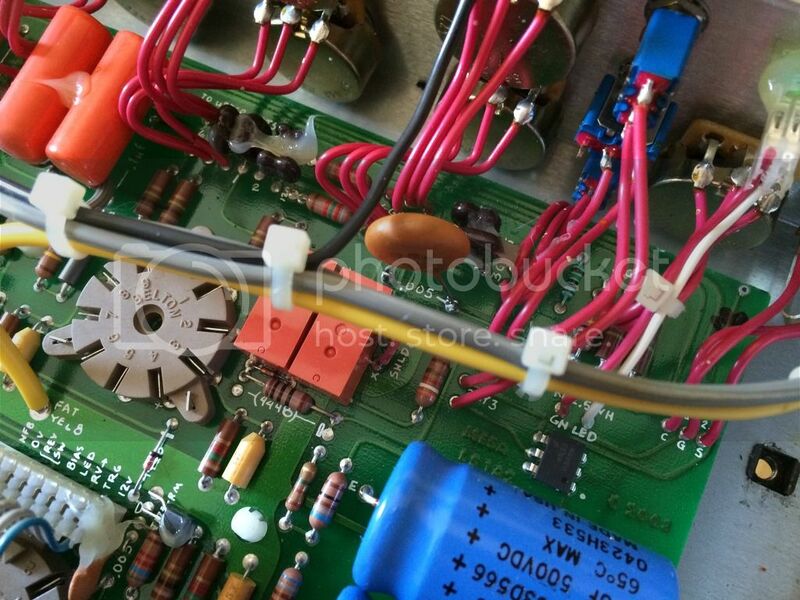 No, the disc shape pale orange capacitor that you see in the above pictures is the capacitor that replaced the original. The original looks like the other bright orange tube like capacitors that you can see around the disc shaped one. Indeed, the value of the original capacitor was 0.005uf or 5nf if you will. That got swapped with the 1.5nf disc capacitor. Thanks for getting back to me with that info! Last edited by ToneDrone on Tue Jun 13, 2017 9:32 am, edited 1 time in total. Just a quick report on this topic, I modified all my Lonestars, including the Special. The 1000pf (1nf) capacitor seems to be the best. So, the one with the 1nf capacitor gets played the most. Not because the others don't sound as good, I can always adjust the bass to my liking. I tried the original type Sprague capacitors, 1.2nf and 2nf are the values I could find on ebay. Just because I wanted the amp to have the same type of capacitors mounted inside, for aesthetics if you will. However, they do not sound the same. I will say again, they do not sound the same. My tech explained to me that you need a ceramic capacitor there as well as for the phase inverter. He checked the Lonestar, he told me that the value is correct in the phase inverter circuit but the capacitor is not ceramic. I did not change THAT capacitor. He also told me that in all the boutique amplifiers like Trainwreck, Komet, old Fenders, the capacitors are ceramic. Some places in the circuit require ceramic, others require silver mica. For a reason. I would like somebody from Mesa to give us a professional oppinion on this subject. Interesting! I'm struggling with this issue as well. I'll give it a try. I just need one of those caps. Oh btw, nice playing on that clip! What volt cap? Is it possible that I could get a link as to the exact cap so I could purchase it? I have no electronics store near me. Thanks in advance. Unforunately I only know that the capacitor in question (the one that my post is about) is a ceramic 1000pf or 1nf. The original capacitor is 5nf 600 volts so the new ceramic one should have at least the same voltage rating but I think you will be fine with a 800 or 1000 volts as long as it isn't too big in volume so you may have dificulties mounting the thing. Try ebay for a cap like that or go online and look for an electronic parts shop. Personally I got it from my friend who is passionate about amps and has a lot of vintage parts. Thanks for the kind words, good luck and make sure you share your results. Does this mod cut bass feeding into the entire channel two (with drive on and off)? You refer to the capacitor cutting bass to the drive channel so I'm not sure if you mean the mod effects all of channel two or only the drive section.